This amazing festival now in its fifth edition attracts over 600 people worldwide, making it a truly international success - about 50% of attendees travel from all over Europe, hailing from Poland, Spain, France, Germany, Denmark, Switzerland to name a few – and as well as the USA, Canada, and further afield. Over 20 artists from all over Europe, Africa and the West Indies will join BATUKE! 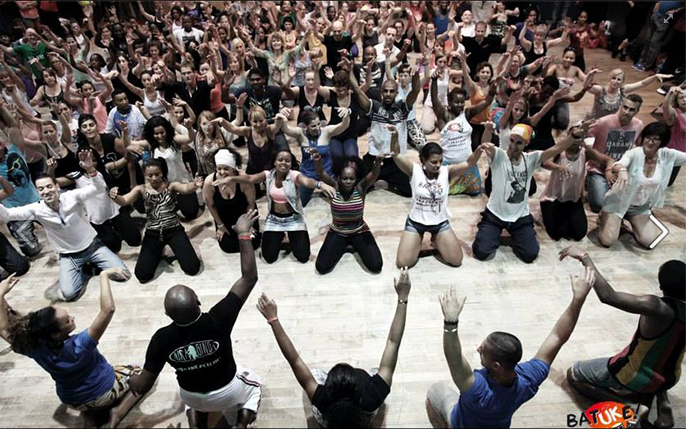 to deliver 40+ intensive workshops in modern and traditional Afro-Latin & Caribbean dances, musicality, and percussion. Absolute Kizomba beginners will be catered for with intensive first-starters classes while improvers, intermediates and advanced students will appreciate more specialized classes like Semba or Passada. For the first time in 2014, we will also have exclusive input from one of the most talented DJs on the Kizomba scene – DJ Barata, as a special guest host, and delivering his own brand of masterclass! Everyone will be on a par when it comes to certain rarely-taught dance forms such as Coladera & Funana (Cape-Verde), or Rebita (Angola)! This year’s event will feature artists from countries whose rhythm play a high influence in African pop culture and world dance. Saturday evening shows will be arranged into one unique and uninterrupted performance. Choreographed by Iris De Brito – 2x UK & Open World Salsa champion and native to Angola - it will follow a story line taking the audience through the Afro-Latin world.